7.84 points at 51 votes (rank 121). 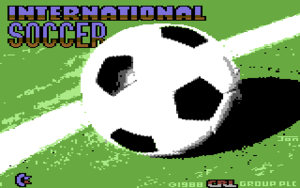 Rombachs C64-Spieleführer 9 September 1984 - "Vote 1 - list of recommendations"
International Soccer (also known as International Football or as Swedish version as Cup Final) is a soccer simulation where two teams with each seven players (six of them are on the field and one is the goalkeeper) compete against each other. 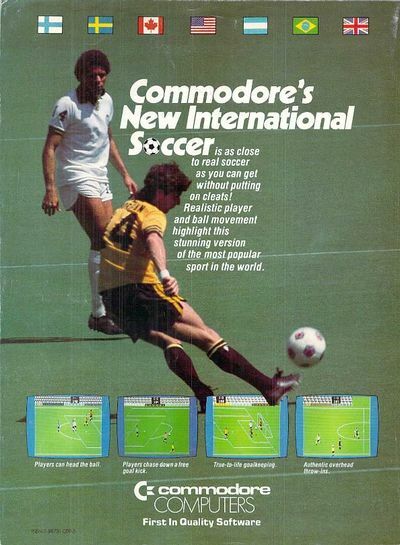 The game can be played against a human opponent or the Commodore 64. The computer-controlled players have a relatively good AI for 1983. They shoot high and flat balls, try to trick you, make throw-ins and storm the opposing goal. When the game is over, the captain of the team gets a cup handed over by a beautiful woman. The game impresses with its many technical subtleties as different speeds of the players (running forwards with ball at the foot or juggling it on the head), skilled headers, passes, tricking the goalkeeper, etc. On the screen you do not see the whole pseudo-3D field, but only the sector where the ball is. The scrolling of the game area is soft and the players move fluently and are accompanied by for this time realistic sound effects. After a short time of waiting a demo game starts. At the start you will be shown two players representing the two teams. With the help of the function keys you can adapt the short colours to your wishes, this is with the key "F1" the colour of the left team and with the key "F3" the colour of the right team. If you do not use a colour TV to play, you can optimize the contrast by pressing "F7". If you want to compete directly against another player, just press the button of your joystick. To compete against the computer, you need to set the strength of the computer - your opponent - by pressing the key "F5" once or several times. The game strength goes from 1 (easy) to 9 (very strong) and will be shown as a big number instead of the right player. After choosing the strength, here press also the fire button to start the game. Restart of the game: to start a game anew press the keys "RUN/STOP" and "RESTORE" at the same time. The title screen then appears again. Every team consists of 6 field playersa and one goalkeeper. After the two teams have entered the field for the first half time, the kickoff by the referee starts the game. 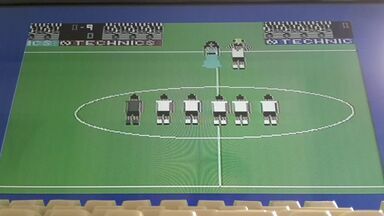 Each one player of the team (the one which is displayed a bit brighter on the screen) is now under your control. It follows directly your joystick movements, i.e. you can move it into one of the four directions or diagonally and shoot the ball into the direction the player walks by pressing the fire button. The game is laid out in the way, that every player stays under your control for as long as possible. Only when another player is closer to the ball and the ball is led by an opponent, the control goes over to this player. In case of an attack of the opponent inside your own goalmouth the control goes over to the goalkeeper. By pressing the fire button at the right moment you can let him make a parade. If the ball leaves the field during the game, the opposing team gets the ball. The throw-in, the goal-kick or the corner is not done by the controlled player, but by another player of your team. This happens automatically after some time, but can be speeded up by pressing the fire button. As SOCCER should be a fair game, there are no fouls and also no penalty kick in this game. A game lasts two half times at each 200 units (approx. seconds). In the half time both teams go into the dressing rooms and then for the second half again onto the field. A change of sides is done during half time break. Scores and the time left are constantly shown on two scoreboards to the right and left of the kickoff spot in the middle. The scores are shown in the shirt colours and by this clarify the sides of the teams. There is a quite unfair trick that only seldom works - you actually can kind of lift the ball onto your head and then walk into the goal with the ball bumping on the head, preferably into the goal of the opponent. No countermeasures are known. Sledgie: "Simple 3-D - soccer. Good sports simulation from the beginnings of the C64 time, which is fun alone against the C64." 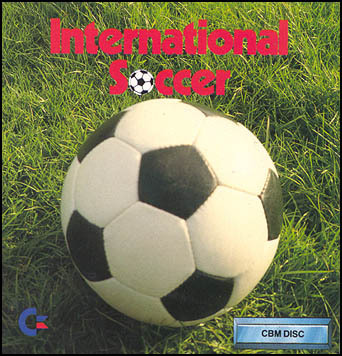 Guybrush: "My first computer soccer game, made extremly cheap but in 1983 the development in programming was not much further. If you consider this, the game was very good. 6 out of 10." TheKills: "I never quite liked soccer as a video game, however, I give for this pleasing graphics and the fact that this soccer could yet fascinate me, even if only for a few minutes in the week, still 6 points." SubsTanzTee: "This game was for many players from the very beginning (1983/84) the reason for buying a C64. Today you would call it a killer application. The horizontal scrolling was a great sensation on a home computer. The controls are intuitive and the game is still great fun, independent of its date of release. 9 out of 10." Shakermaker303: "Ah, that was quite fun. With impossible moves you could exasperate your opponent. E.g. with a big luck and skill you could catch a ball with the head in a way that results in balancing the ball on the head. The other one has no chance to get the ball and this way you had safely crossed the field and could easily make a shot at the goal. Old game, but all the same good, therefore 8/10 points." In this game, the highest result against the difficulty grade 9 counts.